More than 8 million homes across the UK are owed money by their energy supplier after being charged for energy they didn’t use, new research has found. Price comparison website, MoneySuperMarket, discovered that after a mild winter, energy customers used less energy than expected and ended up paying for energy they didn’t use as a result. A grand total of £909 million was paid for unused energy in the UK, meaning that the average home, currently in credit with their energy supplier, could be able to eligible to reclaim money. With the energy price cap set to rise by £117 from April 2019, Stephen Murray at MoneySuperMarket encourages homeowners to reclaim any money owed as soon as possible: “The easiest way to find out if you’re owed money is by taking a meter reading and giving it to your provider, so they know exactly how much energy you’re using, rather than just charging you based on estimated usage. Before looking into how you can claim a possible refund and how you would receive it, it’s worth noting that direct debit payments cover energy supply for the entire year. So, if you pay by direct debit seeing your account in credit during the summer is perfectly normal as it will drop back down during the winter when you’re much more likely to have increased demand for energy. Some energy suppliers, both large and independent, automatically refund customers owed money. Automatic refund payments are made on the yearly anniversary date that the energy tariff began. 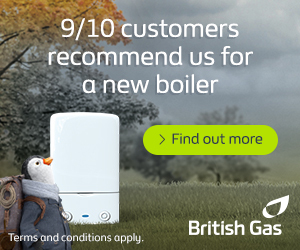 British Gas Automatically refund customers above £75 in credit. Scottish Power Automatically refund customers above £75 in credit. EDF Energy Will refund as a discount on next 12 payments. Around 54% energy customers paying by direct debit aren’t eligible for an automatic refund so it’s worth checking. To make your claim, you’ll need to send a meter reading to your energy supplier – check with your supplier first though as policies vary. Customers with a smart meter installed in their home are unlikely to be eligible for a refund as smart meters provide the energy supplier with frequent meter readings. So, you’re only paying for the energy you use. However, if you have a first generation smart thermostat and have switched supplier since it was installed, there’s a chance it might have gone ‘dumb’ and no longer work. Your energy supplier will be able to let you know if it’s working. PREVIOUS POST When Should You Replace Your Boiler?